I'm completely satified with the work done in our new home. Fast clean and easy to deal with. Thankyou so much for the wonderful paint work. My family misses you already. The Faux tile back splash looks amazing. Thanks a bunch! Andrew, Your attention to detail and eye for colors helped us out alot. Thanks for a great job. You can use me anytime for a reference. I highly recommend happy homes painting. When I came home from work, I was not surprised with how wondeful the job turned out. What I was most impressed was how neat, clean and fast you are. As long as you continue in this profession you've got our vote to complete the entire house. Thank you so much. Ronnie and Robert Scarboro, Indian Trail, N.C. I was looking for a painter that was going to be good as well as reliable and knowledgeable. I received this company as a referral from a friend and I must say it was one of the best referrals I have ever received. I had my entire house painted and it is gorgeous! Andrew Raphael, the owner, was great to work with. He was very helpful in providing feedback about textures and very honest about costs and brands. He worked quickly and efficiently and his work was beautiful. His faux finish work is great and I love the fact that he is prompt and friendly. He is a very trustworty person and I was comfortable leaving him during the day when I had to leave home. His estimates were very reasonable and I like the fact that he does the work, not a group of people that I never got to meet. I am very happy with the job he did for me! Call him! You won't be disappointed! Gilda Mack Benton Charlotte, N.C.
Andrew was one of five painters I had prepare a quote for exterior painting of my home. His quote was the only one that included pressure washing and did not charge an extra $200-$300 for painting the shutters. He spent an entire day pressure washing the home. It looked like a whole new house. The real change, however, was when the painting took place. My home looks brand new, and fantastic. Andrew showed up when he said he was going to, tolerated my many questions and did meticulous work. I have used Happy Homes Painting for years. Every time I buy a home I call Andrew. They are second to none in neatness and reliability, and also Andrew has an eye for design. As a home improvement producer for designing spaces on Lifetime TV, I think I can judge their work extremely well. You will not go wrong using them for all your painting needs. Andrew's (owner) meticulous painting skills has turned our once dreary, dark & gloomy home into the home of our dreams! We are amazed how having a freshly painted home lifts your spirits when you come home from a hard day at work. 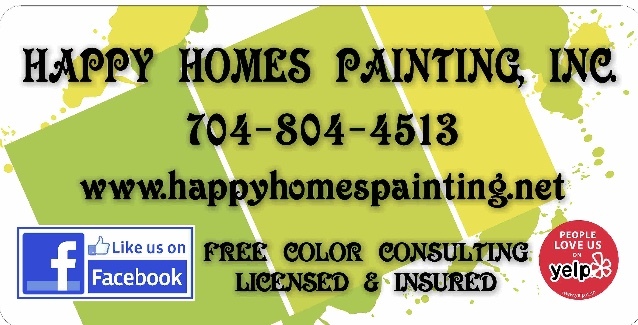 Hiring Happy Homes Painting was the best choice we've ever made for our family home. Andrew is very professional, friendly and trustworthy. He goes out of his way to answer questions and is extremely reliable. I feel completely comfortable leaving my home while he was working. Thank you for going above & beyond in making our family feel as though we were the most important customer you've ever had. I will NEVER hire anyone else to paint my home again. THANK YOU! !